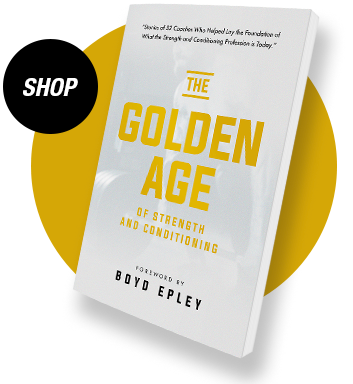 In The Golden Age of Strength & Conditioning, 32 college and professional strength coaches share their story of how they became part of the “golden years” of strength and conditioning. From sharing their start in the profession, to the adversities they had to overcome, and the philosophies and principles that guided their careers, these coaches proved why strength and conditioning is important to almost every athlete in every sport in the world. Chip Sigmon is the Fitness/Wellness Coordinator at Europa Sports Products. It was the year 1977; I was a junior at Appalachian State University (an undergraduate mind you) when I got a phone call from ASU head baseball coach Jim Morris. He asked me if I would consider working with his baseball team to set up a strength program during their off-season. I had just won the Mr. North Carolina bodybuilding championships, and word had gotten around that I was into weight training and was even writing up programs for students and student athletes. Somehow and someway in 1981, I heard of an opening for an assistant strength coach position at the University of North Carolina, interviewed, and got the job. Mike Marks, former head strength coach at Alabama, was coming to Chapel Hill to head up the strength program. Mike was a great guy—knowledgeable and mild mannered, but he could be intense when needed. ­That is a key principle I learned that has helped me along the way. UNC’s 2000 square foot weight room was strictly for football. On one side of the room were squat racks, in the middle were platforms, and on the other side were bench presses. We had a couple of Nautilus machines in the corner of the room and in a smaller room off to the side. One day coach Marks asked me and another assistant to put together a new leg press machine we had just gotten in. Th­e other coach was Jerry Palmieri from New Jersey. From then on, it was the North versus the South. For nearly four decades, we have argued like an old married couple, but a better friend I could never have. At one of our first strength and conditioning meetings, coach Marks went around the room and asked our staff questions about lifts and techniques on certain exercises. I had remembered reading in the NSCA journal about “compensatory acceleration” a few months earlier. When Mike asked me about a certain lift, (I cannot remember which one) I nailed it by using that term in my explanation. I learned right then that “knowledge is power!” ­And that fueled an important key principle for me: bring a ruthless pursuit of knowledge daily. I don’t let a day go by without reading or watching information to make me a better coach, and a better person. Our staff worked with all teams at Carolina, however the weight room for all other sports was down in the lower section; another term for “basement” at Woolen Gym. Woolen was attached to Carmichael Auditorium, where the basketball teams practiced and played. Again, the equipment was the good ole’ blue Nautilus machines and free weights. I could tell you stories of Michael Jordan coming down to workout and lift, but what I remember the most, even back then in the early ‘80s, was the bench press squat, the overhead press, and the cleans were the staple lifts for most of the UNC teams. I was still at UNC in the summer of 1983 when I made a telephone call back to my baseball friend Jim Morris to see if ASU was ready to hire a strength coach. Amazingly they were! Coach Mack Brown was in his second year as head football coach. One of his assistant coaches, John Palermo, was in charge of the football team’s weight training but Mack and the AD were looking for someone to step in and take over as strength coach for not just football, but for all the teams. ASU was indeed ready for the next step, and timing, once again, was everything! 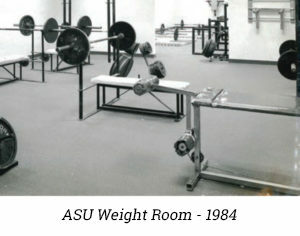 In January of 1984, I headed back to where it all began as ASU’S first strength & conditioning coach. It would just be me, no assistants, and I would be working with all teams. And my salary? I probably didn’t tell others then, but it was $0.00. I only got room and board. My home for the next year was a small room under Owens Field House where the officials dressed for game day. It was about 100 square feet with a small bed, a shower and no heat! ­The North Carolina mountains are really cold, so after a few weeks, assistant AD, Rachel Laney, brought me a small electric heater. ­Thank God, as I was beginning to freeze at night! I also received a free training table, but many times I would work with the athletes so late that I’d miss the training table times and go to bed hungry. Our weight room was on the lower floor of Broome-Kirk Gym, about 800 square feet with no windows. It was a combination of two rooms with a wall knocked out in the middle to make up the 800 square feet. One room was comprised of bench presses, incline benches and dumbbells. The other room had two platforms and the rest was for squat racks. ­There was no music system and I had no office. Since we were in a basement, by the summer I had noticed how bad the Olympic Bars were rusting. So, I went to the local hardware store and purchased some WD-40 and dehumidifier bags and hung them all over the weight room walls to prevent the rust. I remember Coach Brown at one of our staff meetings saying, “I hired a strength coach and now all we have are pulled hamstrings!” I had the team performing a lot of hip extension work, RDL’s for example, but was limited on my own knee extension. I left that meeting, got on the phone to call a friend of mine, and somehow talked him into donating two leg curl machines and a stereo system. Two people at ASU who really gave me a tremendous amount of support were Dr. Harold O’Bryant and Dr. Michael Stone. Now, when I first arrived at App State, I heard that Dr. O’Bryant and others in the exercise science department (Dr. Stone was not there yet) were displeased that they were not included in the hiring process since the strength coach would be working with all teams. Therefore, I knew I needed to get Dr. O’Bryant on my side and use his expertise to make him feel a part of the strength program. I made sure I was in his office and Dr. Stone’s once he’d arrived, weekly if not every day. I always asked them questions, told them about my workouts, and listened. ­Their advice was invaluable. Additionally, the current NSCA president, Dr. Travis Triplett, and my future wife, were both exercise science graduate students. Her insight was a tremendous help. The decade of the 80s was all about the Jane Fonda aerobics, and Dr. O’Bryant and Dr. Stone were on the opposite end of the spectrum when it came to that type of conditioning for power sports. Boone is very cold in the winter, but having an indoor facility for football was out of the question in those days. I had to condition the football team on the balcony of the basketball gym, which was hard concrete! One winter I had a few college co-eds condition the team by performing aerobics in the gymnastic room. Dr. O’Bryant called me into his office and let me have a piece of his mind! “You know your squat strength and power will decrease,” he said. I tried to justify my situation to him, but he was right. Soon the entire football team’s strength and power had went down! It was a learning moment for sure. Thankfully, I had achieved my goal of proving the need for a full-time strength coach by year two. Every head coach for all Varsity teams took money out of their budget to actually pay me a salary. I can’t remember the exact amount but at that point, I felt like it was a million dollars! Needless to say, I had more incentive to work my rear-end off for each of those coaches. A lot of days I would be in the weight room before the sun came up and still there after it went down, never seeing the light of day except to eat. If I got sick, no one knew. Who would take over for me anyway? At one point, I had the flu so bad that I didn’t think I could put one foot in front of the other, but it didn’t matter. I had to act as if I was okay and keep going. Again, hard work paid off, as year three had our AD, Jim Gardner, petitioning the NC State Legislature to create my official position with a state paid salary. Somewhere around 1986, I officially went full-time making $21,000. To this day, I remain eternally grateful to ASU for giving me my start, and this award-winning university continues to be one of my favorite places on earth. As the strength and conditioning program evolved, I started to get some help from the exercise science graduate students. Some much needed help, I might add. You see, in those days, one strength coach worked with all sports. With my assistants came help with instruction and the writing up of the many workouts for all athletes from all sports. ­These individuals played an important role in the success of our entire athletic program. We won two Southern Conference football championships during that time, and countless other conference championships in all the other varsity sports. I give my staff a lot of credit for the success during those years. My staff eventually consisted of seven assistants (paid and unpaid). ­These individuals were the heart and soul of our strength and conditioning program. Dan Duncan: My first assistant co-published an article with me on the Hack Squat for NSCA journal in 1990, now a successful businessman in Texas. Kevin Kaga: A successful H.S. Strength & Conditioning coach in SC for over 30 years. Ben Cook: Went on to be the Head Strength coach for the UNC Tar Heels Men’s basketball team, and now is a NASCAR performance coach. Anthony Glass: A successful strength & conditioning coach in his own right. Had stints at Boston College, University of Georgia, and Ohio State University before coming home to be Head Strength coach for Olympic sports at ASU. Roger Morrison: Has had a successful career in Health and Fitness. Jennie Mix: My first and only female assistant. Rick Parker: Now a successful high school principal in Charlotte, NC. For some 25 years, Rick has been my early Saturday morning workout partner. Our brutal leg day is known by many! Lee Barnes: I would like to share a letter I received a few years ago from Lee. It read, “I am writing you Chip to tell you that I have made a gift to the Appalachian State University Foundation in your honor. 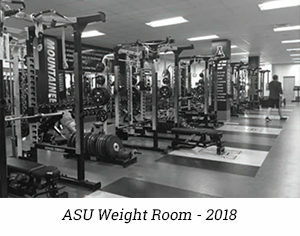 ­The $10,000 dollars cash gift will place your name in the ASU weight room. Your name will be forever etched on the walls of a very important continuing education and training facility.” It went on to say, “Coach Sigmon, you instilled confidence in me when you made me a part of your Graduate Assistant coaching staff. As the only undergraduate, you placed responsibility upon me that many would not have. When you left the weight room one day, you told the athletes, ‘this is Coach Barnes; he is Coach Sigmon when I leave and head to the football field. He is in my shoes. Treat him as you would me when I am out the door.’ Thank you coach for the important role you played in my experience and development at App State.” Lee went on to be a successful business and family man. Now that is what coaching is all about. You never know whom you will influence from one day to the next. At ASU, I had the privilege to work with five great head coaches between 1984 and 1990 and learned much from each. Coach Mack Brown taught me how important it is to pay attention to details and how each element of the program has to be dealt with on a daily basis. Mack was great and had much wisdom when dealing with athletes and people in general. From that, I knew he would be a great success. From Coach “Sparky” Woods, I learned leadership skills. He would regularly ask his coaches their opinions on situations, and then would make a decision based on the information provided. ­That leadership led us to two Southern Conference football championships. Coach Jerry Moore taught me humility and graciousness in the good and bad times. (Mostly good times, since he went on to win three National Championships!) Men’s basketball coach Tom Apke and women’s track coach John Weaver: these two were some of my biggest supporters, taking money out of their own budget to pay me! Above all, these five coaches cared about their players and athletes. ­They knew when to turn it on and when to put their arms around them. ­Th­ey helped me realize that my job was to teach our athletes to be better men and women both on and off the field. The year 1990 brought more changes. I left ASU to become a gym manager and part-time strength coach for the Charlotte Hornets of the NBA. ­The Hornets eventually made me their first full-time strength coach (Th­ank you Head Coach and GM Allan Bristow for the opportunity) and I traveled with them most of the 11 years I was with the team. “Firsts” are hard and exciting, and working with a professional team was no different. I was always in a “proving myself mode.” Our facility went from a small 400 square foot weight room (that I could only get about 3-4 players in at a time) at the Charlotte Grady Cole Center in 1990 to a 2,000 square foot weight room at our brand-new training facility in a Fort Mill, SC in 1994. My NBA professional strength coaching years also brought me the opportunity to work for some great coaches. Head coaches and former Boston Celtic greats Dave Cowens and Paul Silas were gentle giants off the court but intense in their coaching styles and on the court. Lee Rose, assistant Hornets coach and head basketball coach with the UNC Charlotte 49ers who led them to the Final Four in 1977, is a man I gained much wisdom from. John Settle: All-American running back for ASU and All-Pro for the Atlanta Falcons. Hard work and humility is what John was all about. Never complained, just got the job done! Dino Hackett: Linebacker ASU, All-Pro for Kansas City Chiefs. Dino was one of our Captains. Whenever we had a team meal, Dino waited until everyone was seated and eating before he made his way up to be served. Humility and leadership. Alonzo Mourning: Charlotte Hornets NBA. ­This Hall of Fame center was one of the most intense and relentless human beings on the court, but off the court one of the nicest individuals I’ve known; a true gentleman. Dawn Staley: Charlotte Sting WNBA, Head Women’s Basketball Coach USC, National Champions 2017. A solid individual. In just watching Dawn on and off the court, I saw just what a champion is all about. She made every day count. Tony Bennett: Charlotte Hornets NBA, Head Basketball Coach, UVA. I knew Tony would follow his dad’s footsteps. Tony knew basketball, was a relentless worker, was devoted to his craft and payed attention to the details. I learned from Tony character and integrity, and it shows in his coaching at UVA. He is a man of great faith, and still has an influence on me to this day. Plus he’s a great friend. Bring the energy and your A-game every single day. Have a relentless and ruthless pursuit of knowledge every day. Know when to be calm and when to be intense. Have a sense of urgency every day. Today, strength coaches are in the forefront; a major part of each team. Years of well-run, science-based programs all over the country have solidified the strength coach influence. I love watching and learning from these young great coaches of today. Th­ey bring so much knowledge, passion, and energy to collegiate and professional sports, and I love it! I have always said, “I have failed more than I have succeeded, but with those failures have come great wisdom.” In addition, through all of my victories, defeats, and struggles in life, I would be nothing, and would not be “still standing” without the Lord by my side. I thank Him each day. To the th­ree Ladies of my life: My wife Michelle and my daughters Claire and Sydney, you are beautiful inside and out.